I’ve gotten word of another ESRI ArcWeb Explorer example currently out in the wild. The IP address that hosts the SWF is registered to ESRI. 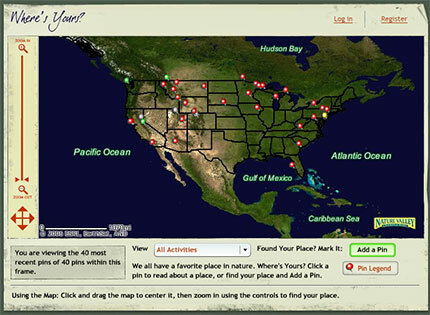 Nature Valley has a section on their website called “Where’s Yours?” which asks people to put pins on a make of their favorite places on a map. You wouldn’t think it was an ESRI map at first glance, but underneath it all is ArcWeb Explorer.